You can improve the insulation of a home and reduce your utility costs with many materials you either have around the house already or can buy inexpensively. Most insulating materials work by controlling air movement. Paper, plastic and fiber can serve to create barriers to air flow throughout a house. 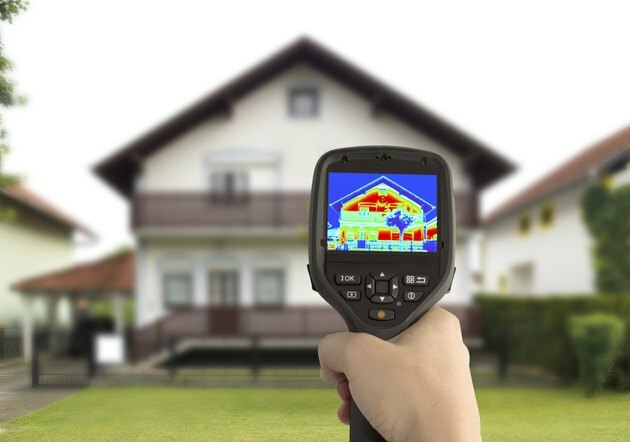 Thermal imaging reveals where a house loses heat. The costs of heating and cooling a home rise when the furnace and air conditioning have to work harder because of leaking air. Air moves when the house is either warmer or colder than the outside temperature. When the house is warmer, cool air blows in on its lower floors. When the house is colder, cool air escapes through the lower floors as warm air leaks into the upstairs. For these reasons, materials that control air flow are effective at lowering utility costs. Paper is the cheapest fix for many drafty gaps around doors and windows. Corrugated box paper's weave makes individual air cells. Cutting along the grain creates long air chambers in a wafer. If the gap is too narrow for corrugated paper, use the core of a paper towel roll. Flatten it and cut it lengthwise to make two V-shaped pieces. For doors that don't seal well, paper can be a temporary fix, though it can be used effectively for any period of time during which the door is not opened. Windows present heat leaks in three ways: they allow drafts around frames; they can go cold and develop convective air flows within a room; and in hot weather, they allow warm sunlight to enter the house. Plastic film can seal windows while letting light through, but in order for it to be an effective air barrier, it must be sealed around all edges. Bubble paper adds insulation because it isolates air in cells. When cut into sheets, dark plastic -- such as that used for many trash bags -- can block hot sunlight. A simple, rolled bath towel can serve as a "door snake" to reduce air flow through a drafty door's threshold in cold weather. Even a doormat that's already there can help if it's pressed up against the threshold. Rolled or folded towels, clothing items or other fabric can insulate cold windowsills. This allows the windowsill to go cold without chilling the room. For blocking unwanted heat, light-blocking curtains or shades can keep sunlight out of a room. It might seem strange to apply ice as an insulator, but it can help when old leaky single-pane window frames are cold enough to develop frost inside the home. An application of water from a pump-spray bottle can form a glaze of ice, which seals air gaps around edges of window panes and frames. If you have snow around the house, you can shovel it up around the foundation to insulate the structure. What Is the Purpose of Door Thresholds?